It is so unfortunate and in the life of someone with an addiction there is always the positive going on. The belief that things will be allright. Often permission giving messages are going on. Thoughts such as “I will be OK”, “Just this one time”, “I’ll stop tomorrow”, “I am in control of it and not it in control of me”, “It helps me create”. These messages and more keep going on. Then there are those who are around them who also unwittingly enable the addiction to continue. Addicts are like children who really want to have their next fix. The brain has surrendered to the substance. The worst thing is those around them who also think that the addict will be OK. It really is not them. In the case of Amy Winehouse people are often willing to overlook the addiction because of her music and her own innate talent. It is often the false beliefs of others that genius needs an addiction. There are many genius’s who are not addicts and are quietly working away at their own skills and talents. A talented individual does not have to have an addiction. It was unfortunate she was unable to direct her energies in a more helpful way. I have often found addicts tend to not be able to be able to let themselves go and believe in a power higher then themselves. The AA (Alcoholics Anonymous) and NA (Narcotics Anonymous) are good organisations that help individuals to break that chain. It does require letting go of the belief in our own power and trusting it more to the universe. It requires acknowledgement of our very own fragility and the temporary nature of our short time here on earth. As regards Rehab. If you can afford it I advise going to a Rehab place in South Africa called Crescent Clinic or Kenilworth. I have known a few people who have gone and succeeded. Don’t go though if you don’t really mean to kick the addiction. Addicts often say one thing but mean another. This is no time to waste even more money, time and the hopes of the ones around you, who love you. I don’t have much faith in Rehab when security is too open and free. In South Africa the Addict cannot easily sneak off to purchase their substance of choice. Also Rehab in a foreign country does not offer familiarity of culture which can so easily be worked within. The addict is used to being persuasive and easily manipulates others around him or her; I have found these clinics are not easily swayed. Real Rehab will also look into the issues that are driving the addiction. The addiction is the symptom, often what lies behind the addiction are other areas that open the doors to a life you could walk through and live. There are three levels of treatment; the primary, secondary and tertiary. Each involves going to a different place and level depending upon the addicts development and acceptance. Primary starts the addict again as a child who cannot be trusted and tertiary enables the addict to move forward as an adult. They live with others and learn to work their daily routines as an adult. Addiction is an attractive state when within it. It is a quick fix and there is something about the secretiveness of it. Success though would be believing that there is something better, a life better then that with the addiction. Many addicts believe they are free but the real truth is their addiction keeps them prisoner. 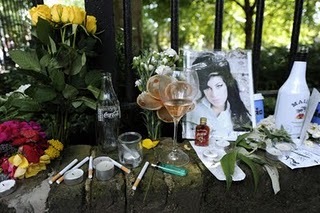 I hope a Rehab place is established in Amy Winehouse’s name but I hope it is strict like those I know in South Africa….. I am not sure where you’re getting your information, but great topic and need to spend some time learning and understanding more. Thanks for wonderful info. Let me commend you on your clarity on this subject. Admirable job. I agree with your “Amy Winehouse and Why Rehab needs to be Really Really Tough”, good post.